How Heartbreak Helped Garry Shandling Find His Comedic Voice The comic, who died Thursday, told Fresh Air that it took him years to develop a style — and then he got dumped. "That was really the beginning of the Garry Shandling dating years in stand-up." 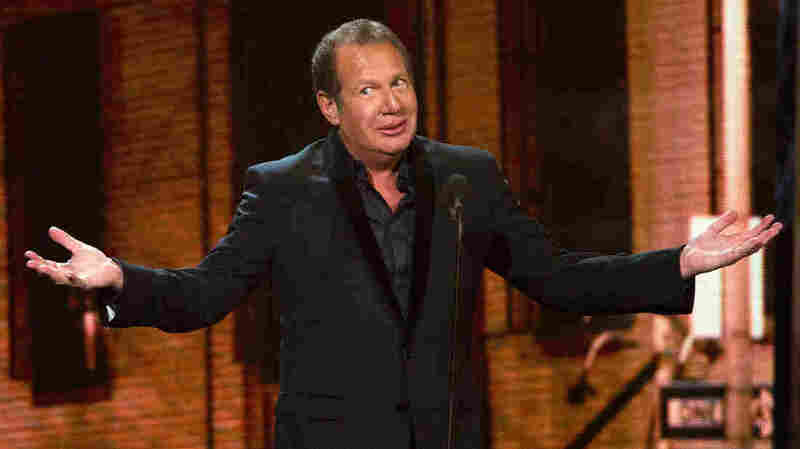 Garry Shandling appears at the 2011 Comedy Awards presented by Comedy Central in New York. Comedian Garry Shandling died suddenly in Los Angeles on Thursday. He was 66. Shandling was best known for The Larry Sanders Show, a comedy that took viewers behind the scenes of a fictional late-night talk show. Speaking to Fresh Air's Terry Gross in 1992, Shandling described himself as "one of those kids who became aware of comedians at a very early age." Though he initially studied engineering in college, Shandling said he decided to move to Los Angeles when he was 19 or 20 in order to pursue comedy. He described developing his stage persona as "a nightmare," particularly since he had never performed before. "I had no idea who I was when I started," he said. "I was frightened to death and had no natural performing skills." But eventually Shandling found his comedic voice, which blended humor and vulnerability with woeful dating stories. "I ... started really [to] spill my guts about being hurt, and people really related to it," he said. In addition to appearing on The Larry Sanders Show, Shandling also wrote for the comedy series Sanford and Son and created and starred in It's Garry Shandling's Show, which aired on Showtime from 1986 until 1990. The following interviews originally aired in 1992 and 2007. It was very odd that at the age of 10 I had memorized the Carl Reiner [and] Mel Brooks "2,000 Year Old Man" routine. ... And I used to watch Don Rickles on TV, and I remember staying up late and watching Jack Paar when I shouldn't have been and Steve Allen when I shouldn't have been. So starting very early, I was very tuned in to the world that I'm in now. My second or third year in the engineering department, I got very frustrated and I sat down with myself and had a soul-searching conversation with myself and said, "What I'd really like to do is see if I can write comedy." ... I moved to LA stone cold. Didn't know anybody; didn't know how to go about it. Really started from scratch. I started hanging out at the Comedy Store watching comedians, and the Comedy Store had just opened, it was 1972. And I just watched and watched — and I had a job as an advertising copywriter at the time — and watched and watched. And I took a comedy writing class at UCLA, and I met a guy whose father was a comedy writer. We started talking and we ended up writing a script together that he gave to his dad, and his dad said, "God, this is really good!" And he gave it to an agent. And I just kept meeting people here and there, and finally I wrote a script for Sanford and Son that I got to the producers, and they loved it and they hired me. They said, "You should write a couple scripts for us this season." I was 24, I think. To be thrown onto the stand-up stage is an experience that you cannot fathom until you're actually there, because there's no place to go and everyone is looking at you and you can't even see them because of the lights. And yet you have to manage to start talking and be funny on top of it. At the beginning, I think I wrote material that was very much influenced by Woody Allen, who is my favorite, and I used to do very off-beat jokes that sounded like I was reading them, and it took years to develop a style. Actually, what happened is I was involved in a relationship and the girl left me. And I was very hurt, very hurt. And I had to go up on stage, and I finally just turned to the audience and said, "'This girl left me." I said, "Well, what happened is she moved in with another guy. So I dumped her, because that's where I draw the line." That was really the beginning of the Garry Shandling dating years in stand-up. My first Tonight Show was just one of those things — I mean this seriously — a cosmic, meant-to-be coming together of circumstance. You walk out there to do your first Tonight Show: Is the audience going to be hot? Are you going to be on fire? It's like an athlete: Are you going to have your moves at a peak? You know, I work in the moment, so if it starts to ignite, then I start to ignite. There's something about the fact that it was just meant to be and you could feel it in the room. There was a place where the audience broke into applause and Johnny fell off his chair. I'm not that funny. I'm not that funny! I have my moments, but, boy, it was packed with emotion, and I think that's what I'm about. I felt emotional about it. A previous Web version of this story stated that the interviews took place in 2002 and 2007. In fact, they took place in 1992 and 2007.